What can I say? White Chocolate Fondant is well worth the effort to make it. The handling of this fondant is so easy that you don’t need a sheeter. I found the secret to making white chocolate fondant and that is using Trimoline which is an invert sugar made of cane sugar. You can find Trimoline sold on Amazon dot com for those of you who can’t purchase it through a distributor. Another distributor is Chef Rubber dot com. You will need a large bowl..and heavy duty mixer is not necessary but is useful for those who can dedicate a mixer just for fondant making because the fondant will eventually break a small Kitchen Aide type mixer. Melt the white chocolate and set aside to cool to a temperature of about 90 degrees F at the time it is to be incorporated into the fondant mixture. Melt the white shortening in a small saucepan, add the trimoline and make sure the mixture is well blended together with a whisk. Bloom and then melt the gelatin in the cold water. It is important not to overheat gelatin. You can microwave it for about 15 seconds and get a temperature of about 110 -115 degrees F depending and this melted gelatin needs to go into the saucepan with the Trimoline and shortening. Make sure the Trimoline and shortening is not too hot..it should not be warmer than the gelatin and ideally the two should be the same temperature. Whisk the gelatin into the Trimoline mixture. Pour the liquid over the confectioners’ sugar and with a wooden spoon stir in quickly. It will form a paste. At this point add the white chocolate and the vanilla extract. Mix with the wooden spoon and then scrape that spoon well. With gloved hands, start working the fondant into a smooth paste and turn out onto a very clean surface that has been dusted with a generous amount of confectioners’ sugar. When the paste comes together and is a smooth ball that is not sticky to the touch nor to the table, double wrap and allow to mature for 24 hours. It is ready to roll out the next day. It will be very firm. You can cut the fondant into good sized chunks and place those into a microwave safe bowl. Microwave briefly, about 10 seconds and turn the fondant over and microwave for another 10 seconds until you feel the fondant actually soften a bit. This is the beauty of white chocolate fondant..the softening takes place in the microwave very quickly and not on your table, bench or kitchen counter. 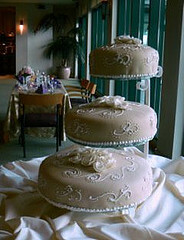 Work into a ball and roll out as for any fondant covered cake. 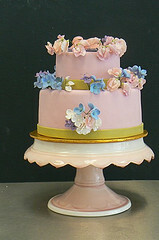 Because ordinary fondant is almost pure sugar, people tend to peel it off of their cake and cast it aside. It is often too sweet for people to eat and that is understandable. 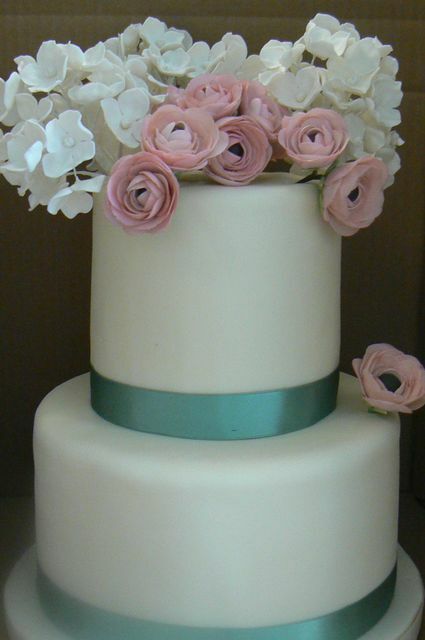 However, by incorporating white chocolate into the fondant, it becomes less sweet. By flavoring it with vanilla or other flavorings, people actually like it. 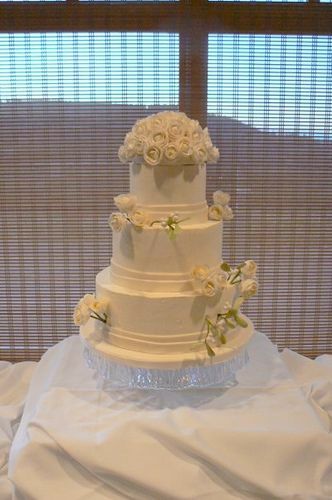 One student reported that guests at a wedding where she served her cake with white chocolate fondant ate the fondant and only one guest ate just the fondant but left the cake on the plate. Whip 2 cups heavy cream and set aside in the refrigerator. Heat the milk and cream to a boil. Slowly add the very hot milk to the egg mixture by first tempering the egg mixture with a small amount of the hot milk and then adding the rest of the hot milk and blend with the paddle of the mixer. Pour the entire contents of the mixer bowl back into the saucepan and return to the stove. Whisk constantly until a bubble appears in the thickened mixture. Cook for about a minute whisking even faster to prevent lumps from forming and to keep the mixture from scorching. Remove from heat and pour into a shallow bowl. Add the Madagascar Vanilla Bean Paste and place a piece of plastic wrap on the surface of the cream to prevent a skin from forming as the mixture cools. Chill in refrigerator for about 15 minutes and take the temperature of the mixture. When the mixture is 87 degrees F. melt the gelatin in the microwave for about 15 seconds and then add the melted gelatin and mix thoroughly. Fold in the whipped cream. This is a stabilized French Vanilla Cream which is suitable for using as a filling in a wedding cake and especially suitable if you are using sliced strawberries or other fruit in the filling of the wedding cake as well. This filling is good with Tres Leches Cake, Dark Chocolate Cake, Vanilla Chiffon Cake with Fresh Fruit Filling etc. If you want to use this in Eclairs or Profiteroles or fruit tarts, simply omit the gelatin and reduce the whipped cream by 1 cup.